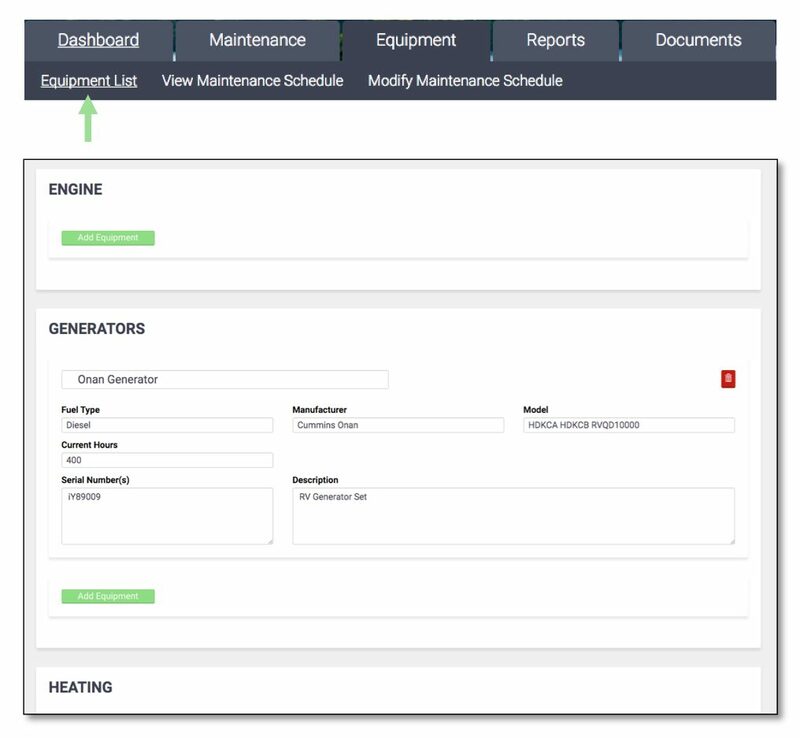 Create blank maintenance tasks for each piece of equipment that you fill in using the manufacturer’s guidelines and documentation. 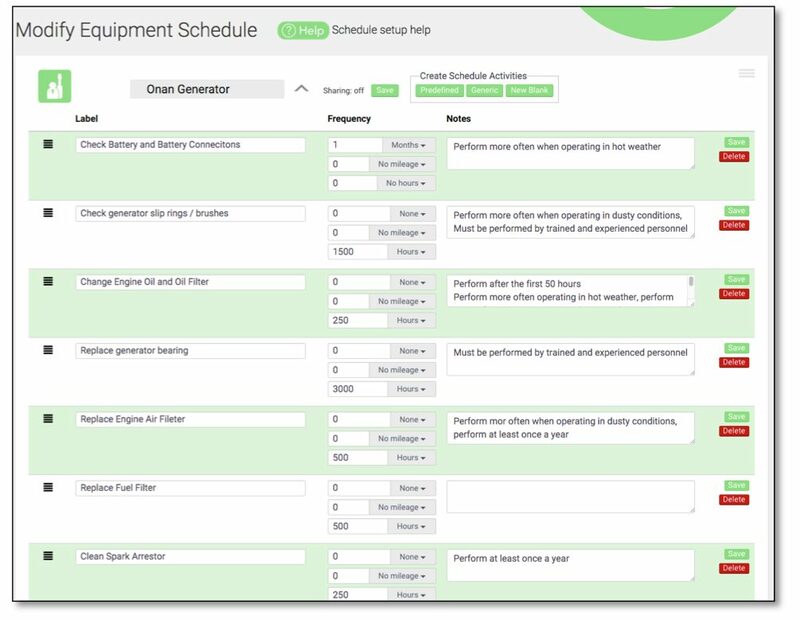 Use our pre-defined generic equipment schedules to get you started with commonly practiced maintenance tasks for a given piece of equipment which you can then tweak based on your manufacturer’s guidelines and documentation. Use our preloaded maintenance schedules based on the manufacturer’s documentation that we have already loaded into the system for your specific piece of equipment. We constantly working to update our available inventory of preloaded equipment maintenance schedules. Nickname – What do you want to call your RV? VIN – This is important to keep your vehicle distinctly separate from others, especially if you decide to transfer your maintenance records upon selling it. Current Mileage – Enter the current mileage of the vehicle, you will be updating this often. Vehicle Type – The vehicle type you select defines the equipment groups that will be available in the system as well as preloaded default and manufacturer maintenance schedules. Make – Year – Model – Enter the specifics here for your vehicle. You will have a list of several equipment categories depending on the vehicle type you selected. In each category you add your specific equipment and the details about it. IMPROTANT: for equipment that will be tracked by hours such as generators. Your equipment list is where you update the current hours. Next you will go to the Modify Schedule Screen. Here you will see all of the equipment you defined in your equipment list. 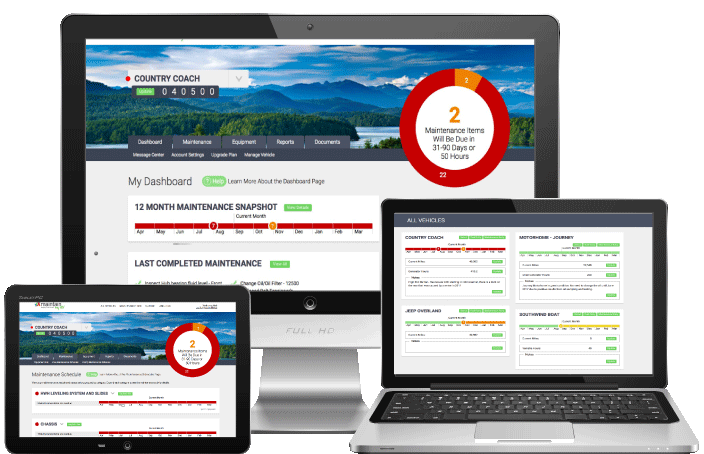 It is here you define your maintenance tasks. 3. Generic – This is where you can select a predefined generic schedule for your equipment. 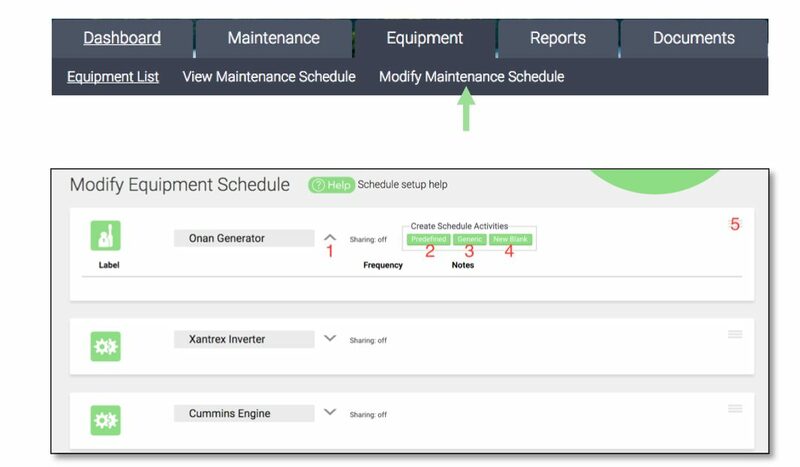 After selecting “Predefined” or “Generic” you will get a popup list of available maintenance tasks you can add to your schedule. You can select all of them at once or just the ones that are appropriate for your equipment. 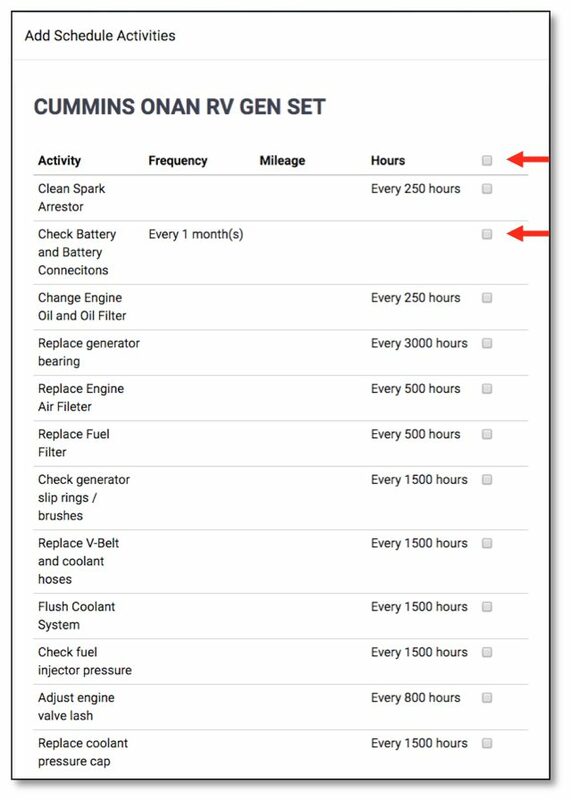 Once you have added the your maintenance tasks you can adjust them here based on your specific documentation. You can change the frequency of any item, add the details of the maintenance task such as parts and supply information or the procedure for doing the task. You have complete flexibility with your equipment, maintenance tasks and how those tasks are scheduled. By selecting predefined schedules you can make all the manuals that came with your vehicle reference material rather than research material.